All Hurricane homes currently listed for sale in Hurricane as of 04/24/2019 are shown below. You can change the search criteria at any time by pressing the 'Change Search' button below. If you have any questions or you would like more information about any Hurricane homes for sale or other Hurricane real estate, please contact us and one of our knowledgeable Hurricane REALTORS® would be pleased to assist you. "One of a kind opportunity! 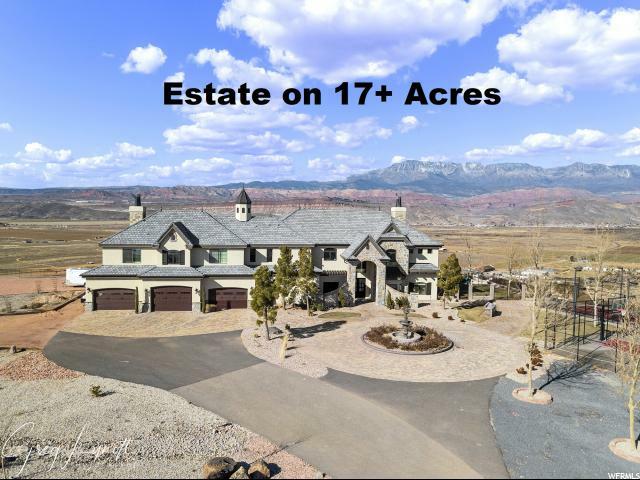 Beautiful estate sitting on a 17+ acre plateau of prime development land with the most amazing views southern Utah has to offer. 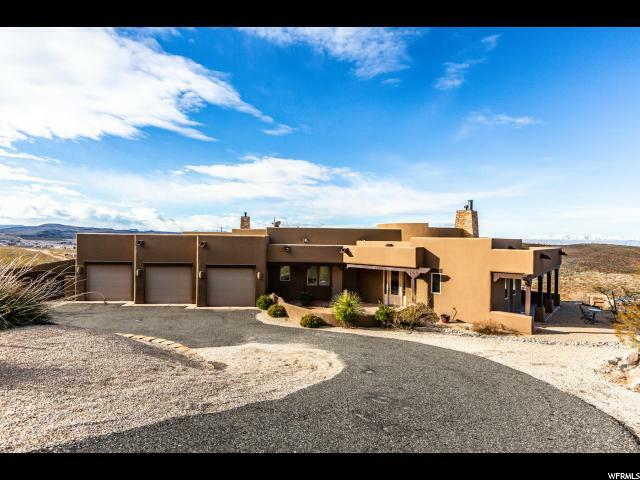 You can literally see two reservoirs from the back patio of this home, incredible views of Pine Valley Mtn, Zion National Park, Sand Hollow Reservoir, the Sand Dunes, Sand Hollow Golf Course, the west valley of Hurricane and the Hurricane Cliffs. Private gate at the entrance of this private drive, tree lined street part of the way. The grounds include a fish/duck pond, private well with 15 acre feet of water, solar panels, pickleball court, b-ball court, circular driveway w/ pavers and a fountain in the middle. 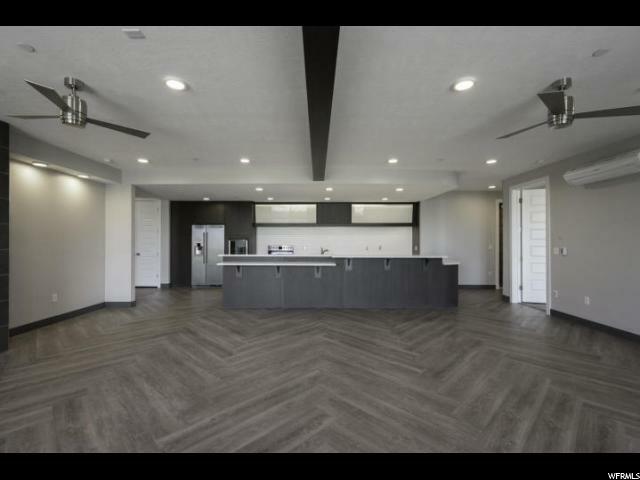 Inside the home you'll enjoy many upgrades- hardwood flooring, custom cabinets, Thermador appliances, hair salon with separate entrance to have your stylist come to you, large windows, huge covered patios and lattices, helicopter pad, large fenced in yard with plenty of room for a pool. 3 phase & single phase transformers for future development, hand chipped stone, brick and stucco exterior, 2x6 exterior walls, central vacuum system, reverse osmosis, smart home with security cameras, smart lighting, alarm system intercom, smart phone controls, 500 gallon propane tank, and so much more! Don't miss out on this wonderful opportunity to turn this into a horse ranch, a view lot subdivision or any of many other development options!" 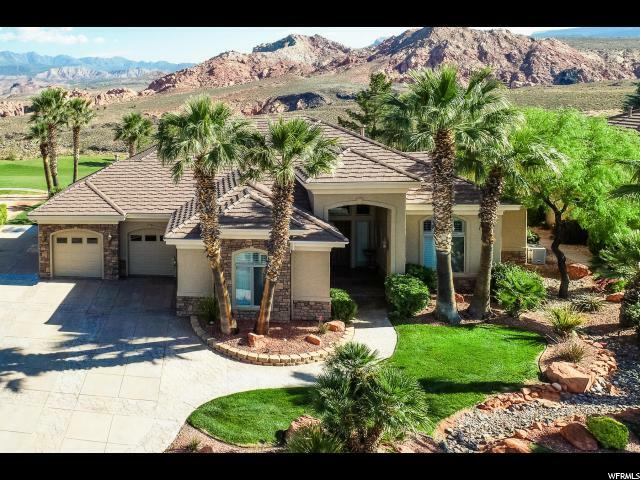 "Privately tucked away on one of Sky Mountain's premier elevated lots, this .45 acre homesite was handpicked for its seclusion & panoramic red rock & golf course views. This spacious home, constructed with quality craftsmanship & high-end custom finishes features 5 bedrooms including 2 large master suites, 5 baths, 2 kitchens, 2 family rooms - & fabulous outdoor living space with large deck & covered patio. 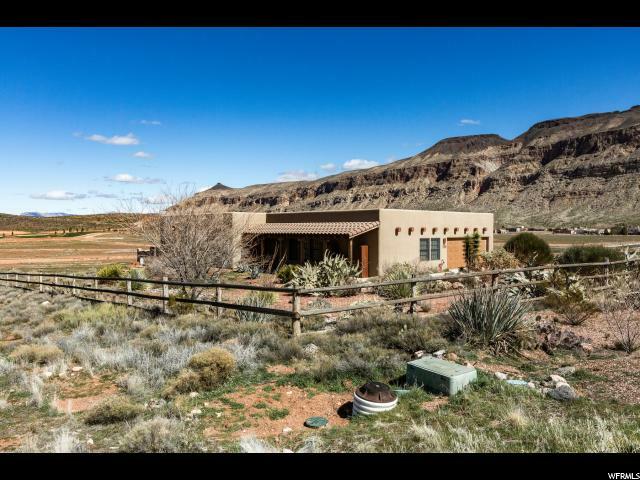 This is the perfect vacation home, located 10 minutes from Sand Hollow Reservoir, 30 minutes from Zion National Park - and only 20 minutes from St George. Explore endless golfing, biking, hiking, ATV'ing, and other recreation opportunities with your family in this ideal location." 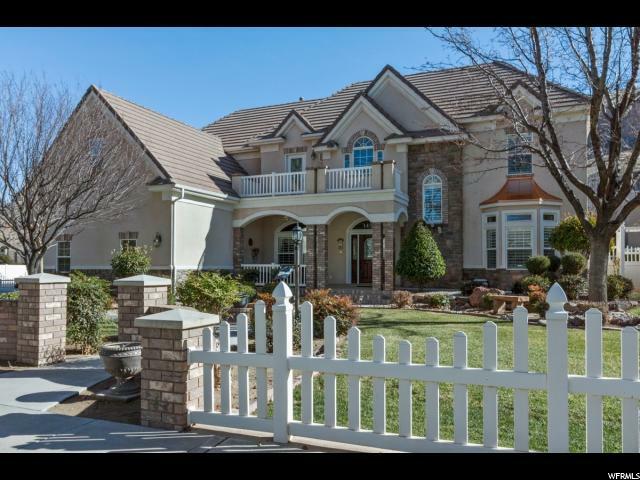 "Exquisite Custom 5 bedroom, 6 bath home with 3 Master Suites. Amazing views of Zions on 2nd hole of Golf Course. Contemporary interior designer touches complete the attractively finished living/entertaining areas. 2 well equipped wet bars, 2 big family rooms, a bunk room on lower level that sleeps 15+ & game room make this home perfect for large families/groups. 3 car garage. Furniture package available. " "This spectacular home has upgrades throughout the home. A rare property with horse privileges. One share of water. The pool and hot tub will provide hours of entertainment for your family and guests. There is an open barn on the property that could be easily enclosed for animals or your toys. Don't miss this beautiful home." "Elegance to Luxury in this beautifully upgraded Villa, four bedrooms with on-suites, each has access to the balconies with expansive views of the Golf Course and vistas. Interior living area provides an ideal setting for entertaining and relaxation by the fireplace. You will love the views through the glass doors or on the fully length balcony. *fURNITURE PACKAGE AVAILABLE. OPTIONS MAY VARY." "This elegant single family home is a place of serenity and peace. With 5 bedrooms, and 4.5 bath it is perfect for your heart''s desire. It''s just down the road from Sand Hollow Reservoir, and also has a pool of it''s own. You will want to see the wonderful views from the second floor balcony and master bedroom suite. Everything in it looks excellent. " "VACATION-RENTAL APPROVED. This is a 7 bd/6 bath floor plan w/ 2-car garage, large deck & patio. Clubhouse w/ outdoor pool, lazy river, natural rock waterslide, splash pad, etc. Close to Zion National Park & Sand Hollow Lake." "WOW! 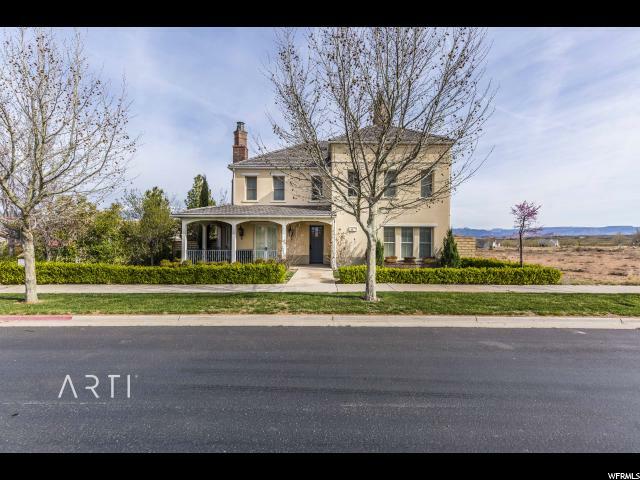 Stunning, well-kept home on the most beautiful, prestigious street in southern Utah! Gourmet kitchen with stainless steel upgraded chef appliances, granite counter tops, real wood flooring with brass inlays, 2 staircases-front and back to upstairs, formal dining room, large game room, family room, and formal front room, mature pruned landscaping (must see apple trees), 3 car garage and RV parking, BBQ area, pool/spa with water feature. Square footage figures are provided as a courtesy estimate only and were obtained from an appraisal. Buyer is advised to obtain an independent measurement. " 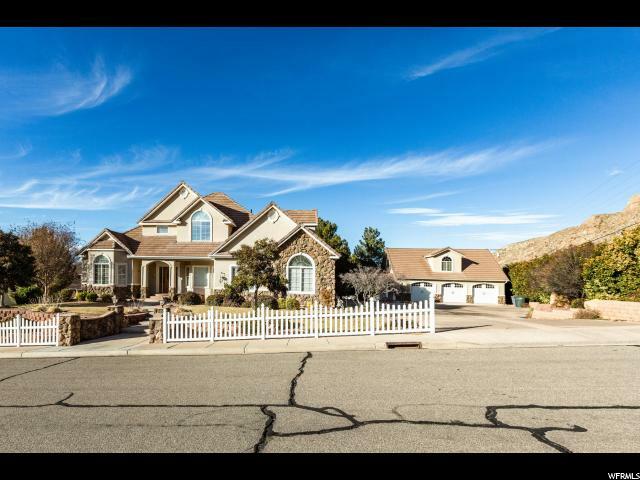 "Beautiful 5 bed 3.5 bath property with plenty of upgrades. 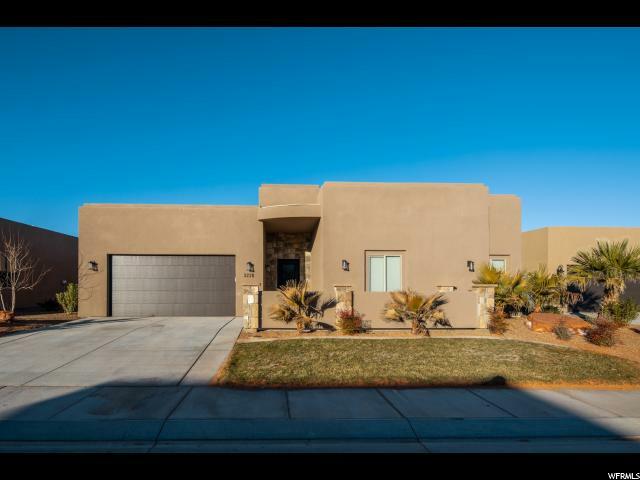 Home features 14 foot ceilings and granite countertops thorughout. Zoned for nightly rental. Home sleeps 15+ and has had great nightly rental history. Furniture package available." "Relax on the large deck while taking in the views of the Golf course on both sides of home, Pine Valley Mountain and Zion. Enjoy the custom architecture and design, Faux marble columns, 3 fireplaces, Theatre room, interior rope lighting, Travertine floors and 2 master suites. Second kitchen, Casita w/ separate parking and separate entrance. Outdoor built in BBQ, fridge and fire pit with seating to entertain friends and family with misters and rope lighting. Possible furniture package. Buyer to verify all information, deemed reliable, however buyer to verify all info including utilities & HOA information if applicable." "Have you ever dreamed of driving down Mulberry Lane, seeing beautiful estates with white picket fences and everyone smiles and waves? Well that is what you'll experience at Robert's Ranch Estates. One of the most sought after areas in Hurricane Valley, tucked away for peace and quiet - there is nothing like it anywhere! This elegant home is located at the end of the street, surrounded by beautiful landscaping and spectacular vistas. Open the door to a luxurious entry way where you will find custom finishing throughout. Open plan main level includes hardwood floors; a spacious gourmet kitchen with granite countertops, double ovens and a center island; huge master suite; living room; study; laundry room; family room with french doors to the balcony looking down on an amazing backyard that includes a fire pit, water feature and majestic mountain views, perfect for entertaining. A winding staircase leads you up to the spacious loft, two guest bedrooms and bonus room. Downstairs, another spacious living area with a partial kitchen, large play area, second laundry and three bedrooms, with doors to the outside patio. Lots of storage throughout. In addition to its many features, a 3 car attached garage and room for RV parking, there is an additional detached 3 car oversized garage/workshop that features a finished loft that would make the perfect studio! If you're looking for a home that has plenty of space for family and entertaining guests without concern for parking this is the home for you! " 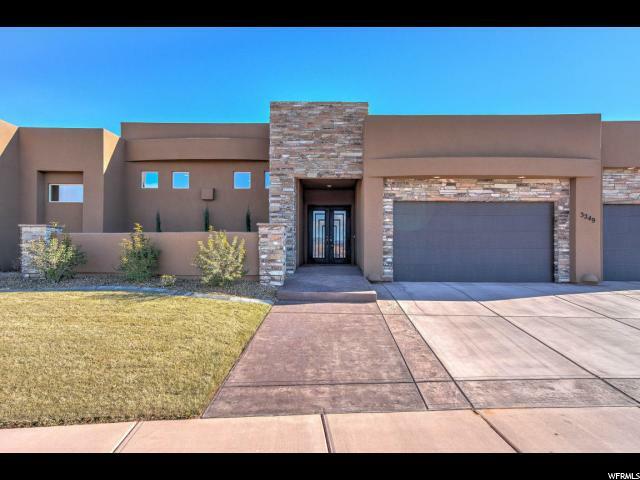 "Breathtaking home in desirable community of Sand Hollow Resort. Full size pool and a garage to park a boat and razor. Nightly rental approved for family vacations and potential investment income. Nicely upgraded throughout w/ high, tray ceilings, granite, custom cabinetry, tile, rock fireplace, stainless steel appliances and much more! Backyard includes in-ground pool, hot tub and incredible views. Furniture package available. (Make sure you see the Murphy bed -Wow!). Close to reservoir, sand dunes, Zions and golf discounts available to property owners. This home is in excellent condition with one owner. " "VACATION-RENTAL APPROVED. This is a 6 bd/5 bath floor plan w/ 2-car garage, large deck & patio. Clubhouse w/ outdoor pool, lazy river, natural rock waterslide, splash pad, etc. Close to Zion National Park & Sand Hollow Lake." "Move in ready! 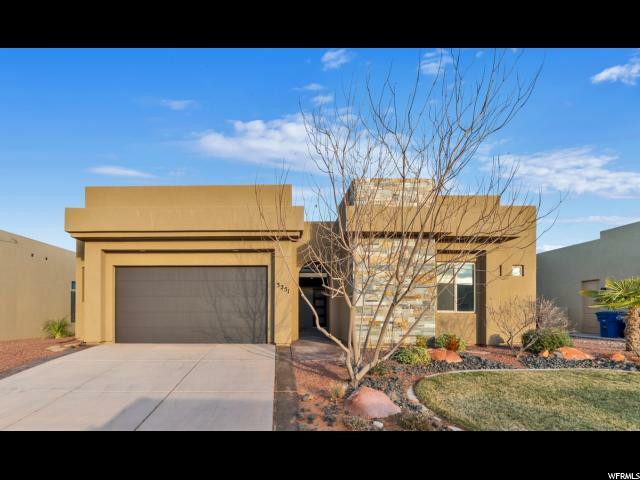 Contemporary Sand Hollow Rambler boasts 12 ft ceilings, an open, airy floor plan for entertaining. 4 bed plus an office, 4 full baths. A spa/pool combo. 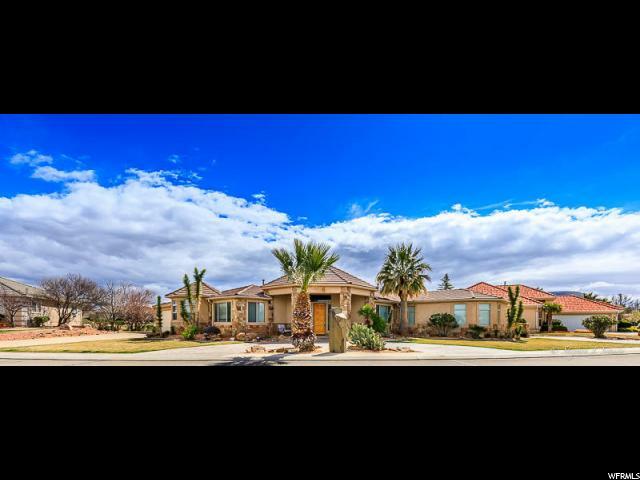 Close to Zions, Sand Hollow Golf Course, Reservoir and Sand Dune Recreation. This home is zoned residential/vacation rental. Perfect for a family or secondary income home." 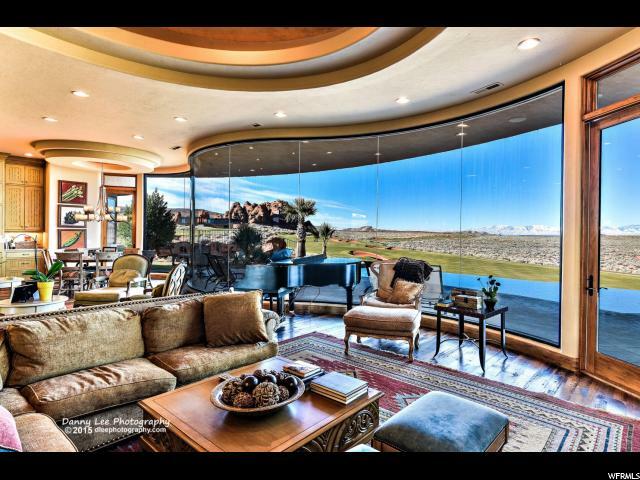 "Magnificent, well-constructed home, perched above the valley floor, on 1.61 acres, with 360-degree views of the cliffs, valley, golf course and mountains! Exercise year-round in a lovely heated swim spa. Watch the sunsets light up the sky with a pink hue while you BBQ in your outdoor kitchen. Gaze at the moon and stars, with no development or light pollution. Enjoy a patio off every room for privacy. New granite, high end fixtures and under mount sinks in bathrooms and laundry. Touchless faucets in kitchen. Fireplace re-stoned for surround beauty. Wi-Fi thermostat, keyless entry, low energy bulbs, new paint throughout and beams in and out re-sealed. This is a dream home, rated 5 stars on Airbnb and the top place to stay and play. With an open floor plan, two master suites and panoramic views, this home is sure to please any buyer who wants privacy, quality, attention to detail and knows true value. Close to lakes, sand dunes, golf courses and amazing year-round outdoor activities!" 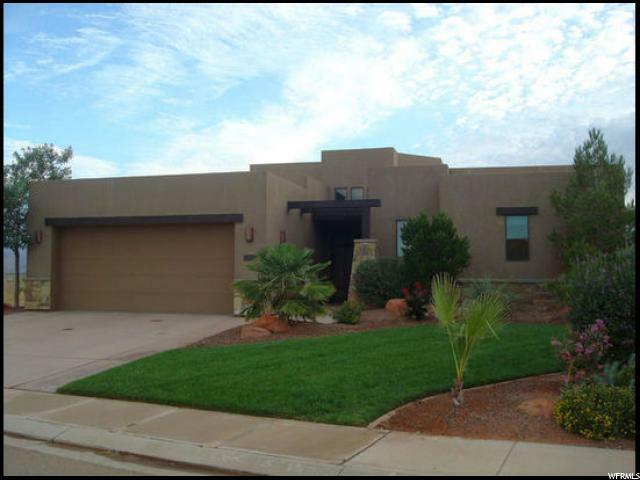 "Gorgeous home in Sand Hollow Resort~ zoned for vacation rentals! This turnkey vacation home has been professionally decorated and features granite tops, wood plank tile floors, stainless steel appliances, & 8' tall doors throughout. The spacious master suite has a large walk in shower & closet. The huge casita has a kitchenette & interior/exterior entrances. It was designed for comfort with independent climate control and additional insulation. The Casita can be occupied and rented independent from the main house. The home will sleep up to 12 and was approved with the city to sleep 10. The cozy interior courtyard creates privacy from the rest of the street. 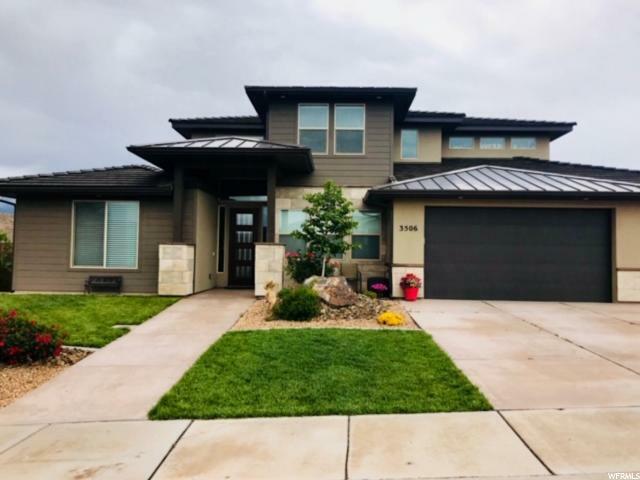 Beautiful mountain views from the living and dining area, master, & covered back patio/fire pit will make this home stand out. Furnishings are negotiable. HOA includes two pools, hot tub, full yard maintenance & discounted Golf. 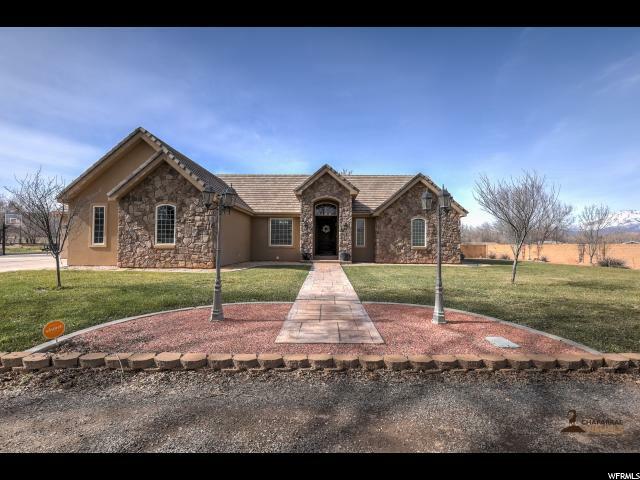 Close to Zions, Sand Hollow Golf Course, Reservoir, & sand dune recreation area. Golf Course Clubhouse has a night restaurant with live music." "Be a part of something really amazing! Enjoy tree-lined streets in European-inspired Elim Valley, while embracing the desert beauty and mild climate of sunny Southern Utah. Dennis Miller Homes blends exquisite architecture with ultra-modern life-style comforts in this beautiful neighborhood. Community features include: clubhouse, pools, parks, and water features. 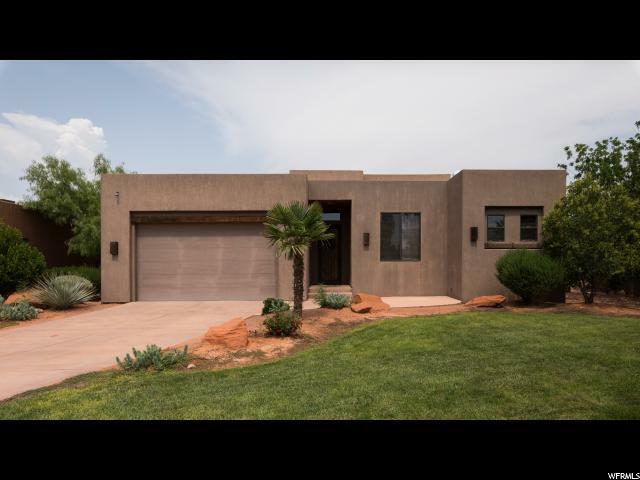 Great location minutes from boating, fishing, sand dunes, golf, hiking, biking, and ATV trails - and a short drive to Zion National Park, the Grand Canyon, Lake Powell, and many other parks and monuments. " "50 ft deep garage with a 14' door and 13'2'' wide. This is big enough to put the RV in the garage! This home will have beautiful finishes including gorgeous white cabinetry, beautiful granite and custom finishes throughout. As a bonus block wall on all fours sides included in the price of the home." "Did you ever dream of a private serene place, with panoramic views of the mountains and a golf course in the distance, with bright star lite skies, at night? This is your secret little get-a-way, that you can fly to, in this airport community. 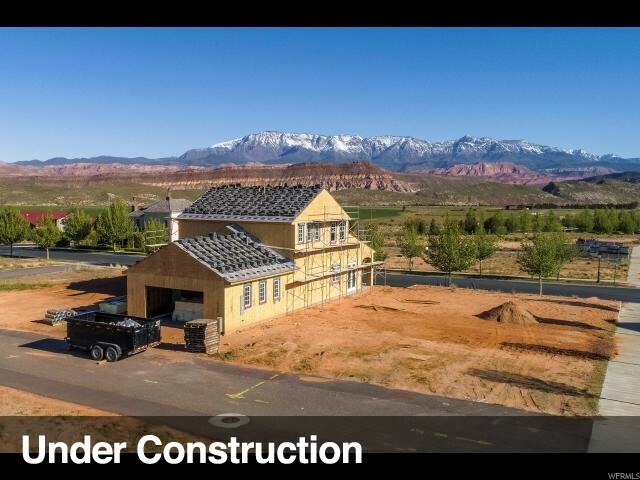 A unique Southern Utah, one of kind development, that has it's own private run way, in one of the most scenic spots in Utah. Enjoy the endless recreation activities at your door step, ride out into the desert or hike to the top of the mountain, to explore the old Indian cliff caves or maybe a day of golf or boating at the near by lake. This little haven is the perfect location, only 20min, from Zion National Park, 45 minutes from Mesquite, Nevada, 1 hour from skiing, 3 miles from a lake and sand dunes and 20 minutes from St.George. Hanger opportunities available. " 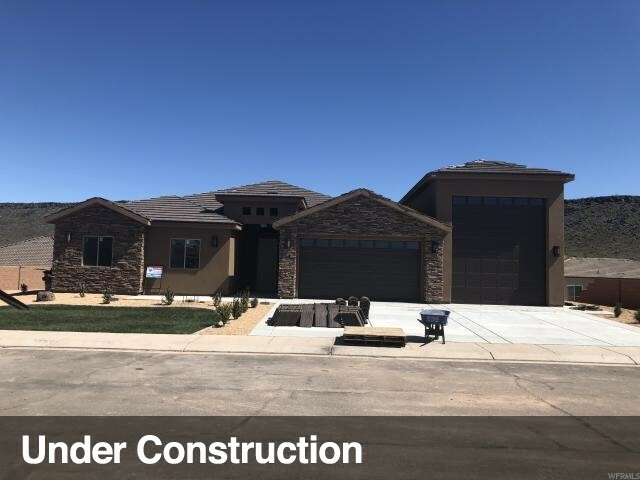 "Don't miss out on this beautiful builders custom home. Built in 2016 with amazing upgrades, great floor plan, this home is the perfect one for you to make your own. Featuring lots of extra storage, large kitchen island and an oversized three-car garage, this home has everything. Call to schedule an appointment today to see this custom built Interstate Home! Possession date to be July 31, 2019. Rock art in the front landscaping to be excluded from the sale." "Huge RV garage that is ~ 55' deep by 23'6'' wide with a 14' tall by 18' wide RV door and a 18' wide by 8' tall two-car garage door. Home features floor-to-ceiling cabinets in the kitchen, drop in cooktop, backsplash, fireplace, 3-tone paint, 8' tall doors, two walk-in closet's in owner's bedroom, jetted tub, walk-in tiled shower w/ euro door, large 2nd pantry with barn door entrance, cabinets in laundry, coffered ceilings & much more! buyer to verify all information." "With an RV garage and an extra wide lot, there is parking for all of your toys, both in the garage and on the side of the house. Tucked away on a quiet street in Dixie Springs, this beautiful home offers 4 bedrooms, a den, and a large upstairs family room. The home is under construction and is expected to be completed in July. It's built by Big Rock Homes, one of the finest builders in the area." "Two Names you can Trust"